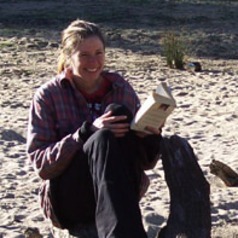 Katy completed a Ph.D on "Metamorphic Fluid Flow in East Central Vermont" in 1999. This was followed by postdoctoral work at the University of Sheffield (UK) on kinetically-controlled mineral dissolution and precipitation in the unsaturated zone of mine spoil. She moved to Australia in 2002 to take up a position as a Research Fellow at CSIRO Exploration and Mining, where she worked on greenstone-hosted gold deposits and the thermodynamic characteristics of sulphur-bearing, high ionic strength, mixed solvent fluids. In 2005 she was awarded an Australian Synchrotron Research Fellowship, hosted by the ANU, and used this time to undertake experiments on S- and Cl-bearing silicate glasses and CO2-bearing solutions. She began a Research and Teaching Fellowship at Curtin in 2007.